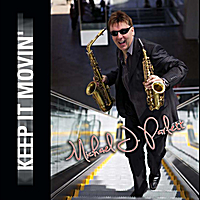 "This album "Keep it Movin' is truly a pleasure to listen to! It is good to hear a great musician release a set of mainly instrumental tracks that have been so thoughtfully arranged and produced. As if playing tenor, alto and soprano saxes wasn't enough Parlett plays a mean flute too somewhat reminiscent of those vibe Dave Valentine GRP days. This album is a surefire winner for all those Should-tinged jazz fans who like a little hump on their Jazz!" Chris Standring.